The LA Galaxy beat the Houston Dynamo with a late goal from Uruguayan Defender Diego Polenta at The Diggity on Friday night. The Galaxy extend their winning streak to 5 games and handed Houston their first loss of the season. While the Galaxy are enjoying their perfect record at home, the game was far from that. Poor performances, horrid referring and a bit of an attitude problem nearly led to dropped points at home. Zlatan Ibrahimovic did not hide his frustration throughout the match, beside scoring the opener from a penalty he drew in the 31st minute. As the game went on, so did Zlatan’s frustration with his teammates, particularly with left back Jorgen Skjelvik. Skjelvik had his hands full, he was tasked with dealing with Houston’s main scoring threat Alberth Elis. Elis has enjoyed a good run of form for the Dynamo, scoring 4 goals in 5 games this season. The Norwegian defender was unlucky to have a penalty called when he took down Elis at the edge of the box, referee Jair Marrufo awarded the penalty after consulting with the VAR crew. When asked about the call by pool reporters Josh Guesman of Corner of the Galacy, Marrufo stated that the fouls was committed on the line of the penalty box, the line is part of the box, thus the penalty was called. Despite having to deal with Elis, Skjelvik still managed to get forward, his decision making and accuracy in the final 3rd however was atrocious. He wasn’t the only player that drew the ire of Ibrahimovic. Uriel Antuna, Ema Boateng, Sebastian Lletget and even youngster Julian Araujo received scowls and complaints for their inability to get the ball to the big Swede. The 17 year old Araujo was making his 1st MLS start and was very impressive in his 90 minute shift. Araujo ventured into the attack often and looked extremely comfortable in Schelotto’s system. Defensively, he was excellent. He stopped many of Houston’s attacks before they crossed the midfield line and showed off his footwork in tight quarters. Still, he got a bit of a tongue lashing from his 37-year old teammate after a miscommunication while defending a set piece nearly caused them to crash into each other. Zlatan was not happy about the near collision, as it could have led to an easy tap in for Houston. Zlatan turned to Araujo and began to yell at him, Jonathan dos Santos, Sebastian Lletjet and Joe Corona were all quick to turn and give the kid some words of encouragement while Zlatan stewed in frustration. Ibrahimovic’s frustration started to affect his own play as he missed chances late in the match. It looked like the Galaxy was going to have to settle for a 1-1 draw but Uruguayan defender Diego Polenta would bail out the Galaxy in the 81st minute. The Uruguayan defender towered over former Galaxy defender AJ De La Garza to score the winner. De La Garza had a bad night himself. He also drew the ire of Zlatan from the opening whistle, later taking him down in the box to concede the penalty Ibrahimovic scored for his 7th goal of the season. De La Garza has several “conversations” with Zlatan thought the game. Jonathan do Santos, who once again had a stellar performance, provided the assist from the corner kick. dos Santos earned himself another Man of the Match honor from the LA Riot Squad supporters group. Romain Alessandrini had to leave the match early due to a knee injury he picked up early in the match. He tried to remain on the field but was unable to continue. Schelotto has since said that they won’t know the full extent of the injury until possibly Monday. Alessandrini’s injuries and performances has called his worth into question by some Galaxy fans. The number of #DriniOut posts on social media has grown over the past few matches. Galaxy fans calling for Romain to be sold so that the Galaxy can go on the market for another DP player that would fit their new playing style better. The Galaxy will now travel to Minnesota for a quick turn around on Wednesday night at the brand new Alliansz Field for an 5 pm PST kickoff. Zlatan Ibrahimovic went 90 minutes and scored 2 penalties as the the LA Galaxy defeated the Portland Timbers 2-1 to cap off Week 5 of MLS on Sunday night. It wasn’t always the pretty, but the Galaxy managed to hold out for a 2-1 win against a Portland side that was determined to disrupt the flow of play through most of the game. Diego Chara was active, constantly being a nuisance and somehow was not booked for persistent infringement. Referee Ted Unkel issued yellow cards to the Timber’s Diego Valeri and Sebastian Blanco and the the Galaxy’s Sebastian Lletget, Jonathan dos Santos and Zlatan Ibrahimovic. The Galaxy home crowd grew frustrated with Unkle’s calls as they felt very inconsistent. The yellow cards that were issued for unsporting behavior to Blanco, Lletget and Ibrahimovic varied in severity while fouls committed by other players, Chara in particular, looked like fouls that should have warranted yellow cards, yet, they were only given warnings. The biggest challenge the team had to overcome on the night was Portland’s Defensive set up. Giovani Savarese’s game plan was clearly to disrupt and destroy any build up the Galaxy attempted and to make life very difficult for the big man up top, Zlatan was fouled hard and often. The result of that however ended in two penalties being called in favor of the home side. Ibrahimovic converted both penalties, Zlatan, always a crowd pleaser, converted the 2nd spot kick with a Panenka which sent Galaxy fans into wild celebration. Portland did manage to catch the Galaxy’s defense off guard in the 44th min with a quick combination play. A wide open Diego Chara received a ball with acres of space in front of him, he played Guzman though, Guzman played a quick 1-2 pass with Valeri and Ebobisse was on the back post for an easy finish. The Galaxy defense left to ponder what just hit them just before halftime. The Galaxy looked in control of the 2nd half, creating many chances to go ahead until Zlatan weaved his way between 3 defenders and in on goal in the 65th minute. Portland goalkeeper Jeff Attinella took down Ibrahimovic as he drew the 2nd penalty for the Galaxy. Zlatan wasn’t done yet, he revealed after the match that he had promised his son 3 goals in his return from injury, the 1 year Anniversary of his unforgettable March 31st debut with the club. He nearly had it in the 71st minute, but he redirected a cross from Joe Corona straight to the Portland keeper. In the 89th min, the table was set perfectly for Zlatan but Jorgen Skjelvik’s waist high cross made it difficult for the Swede to get a foot on. Had the ball been on the ground, it would have been an easy tap in. Zlatan joked in the post-game interview that Jurgen needed to pay his son for the poor pass. Overall, Galaxy fans have to be happy with the team’s home record, a perfect 3-0. They now head to Vancouver for a Friday night fixture. Zlatan has said that he is cleared to play on turf, we will see if the coaching staff feels the same way. The LA Galaxy suffered their first loss in their first road trip of the season. FC Dallas beat the Galaxy 2-0 on a pair of defensive mistakes. The LA Galaxy’s trip to Frisco, TX didn’t go as planned. With injuries to key players like Zlatan Ibrahimovic and Romain Alessandrini, the team went into Toyota Stadium with a bit of a makeshift line up. The midfield featured brand new signing Joe Benny Corona started alongside Jonathan dos Santos with a surprise start from Sebastian Lletget, who was returning from injury. Dallas created a lot of issues for LA at the edges of the attacking areas. The Galaxy having to concede a number of fouls in the first half. Both Rolf Feltcher and Sebastian Lletget saw yellow cards. Diego Polenta was lucky to avoid a yellow card as he hacked down Bryan Acosta in the 34th min. The referee didn’t even call a foul. Still, The Galaxy created chances. At the end of the 1st 45 minutes, it felt like LA could steal the game. Rolf Feltcher and Uriel Antuna hit the post. Corona and Pontius both missed on free headers. The teams went into halftime tied at 0-0. The Galaxy’s luck seemed to run out in the 2nd half however. Diego Polenta gave away a penalty in the 50th min when he kicked Matt Hedges’ arm as he tried to clear the ball from a corner kick. Polenta had already committed another dangerous mistake in the 35th minute when he seemingly played a ball off to Dominic Badji which sent him 1-on-1 with Bingham. Thankfully Badji missed on the shot. Polenta wasn’t so lucky here as referee Armando Villarreal confirmed with VAR that Polenta had raised his foot too high, and too late, kicking Hedges. Reto Ziegler converted the ensuing penalty to give Dallas the 1-0 lead. FC Dallas doubled their lead in the 61st minute with a Bryan Acosta screamer. The play started when Joe Corona’s errant back pass was picked up by Pomykal at the top of the 18 yard box, Pomykal made his way to the end line and sent the ball back to the top of the 18 where Acosta was running on to the ball unimpeded. Bingham had no chance to save that one. Sebastian Lletget’s day had to end early and will possibly be out for next week’s match as he was hit in the face with an elbow in the 57th min. He has since posted on his instagram that he has a broken nose. 16 year old Efrain Alvarez, replaced Lletget in the 59th minute and newly promoted Forward, Ethan Zubak made his first team debut in this match. Zubak and Alvarez combined for the best chance of the 2nd half as Zubak played off a cross from Rolf Feltcher for Alvarez. The youngster took a touch toward the goal, megging a defender in the process and hit a ball that was destined for the top corner but Dallas goalkeeper, Jesse Gonzalez got enough on it to send the ball out for a corner. The LA Galaxy will return to “The Diggity” as they host a Minnesota United team that has been impressive in their first two outings. LA Galaxy opening day was both busy and rainy. The newly renamed home of the Galaxy, Dignity Health Sports Park, had its official unveiling. A number of changes were presented to the Galaxy faithful as they braved the rain. The Galaxy and AEG held a ribbon cutting ceremony in front of the new Dignity Health Sports Park sign early this afternoon. The location is also home to Legends Plaza in front of the Team LA Store at the Main Entrance. The rain stopped just in time for David Beckham to step out onto the stage at Legends Plaza ahead of his statue unveiling. The event was not without the pomp and circumstance of such an occasion. Rob Stone hosted the presentation of the David Beckham statue, the 1st of its kind in MLS. 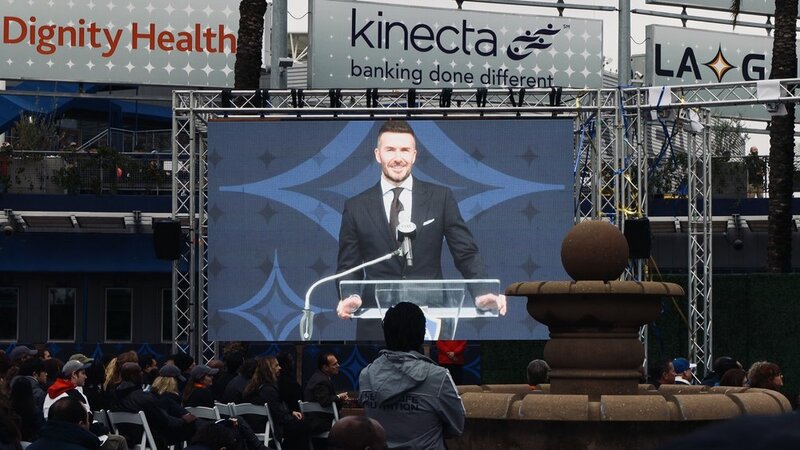 Commissioner Don Garber, Bruce Arena, Robbie Keane, Todd Dunnivant, Mike Magee, Cobi Jons and Mauricio Cienfuegos were all in attendance to pay tribute to one of soccer’s biggest icons. Galaxy President Chris Klein received several loud “BOOs” as he was announced by host Rob Stone and when he came up to give his speech. Many fans feel that Klein is directly responsible for the team’s downturn the past few seasons. Klein however did his best to brush off the jeers. Former Galaxy GM, Doug Hamilton’s widow, Paige Hamilton was also in attendance. She received a nice round of applause as she was announced by Rob Stone. Doug Hamilton passed away after suffering a heart attack while on a return flight from an away match in Costa Rica in 2006. Hamilton is one of three people the Galaxy have inducted to the Ring of Honor. Beckham was the fourth to be inducted at halftime of LA v Chicago later in the evening. Robbie Keane shared some nice words for his friend Beckham as he recounted Beckham convincing him to join him in LA while he was at a training stint at Tottenham. Keane remembered Becks speaking highly of the league, saying that it would be something massive in about 10 years time. Keane said after that, it was an easy decision. Keane joined Beckham in 2011 and was the catalyst that propelled them to an MLS Cup win in 2011 and 2012. Keane also went on to say that Beckham was not only a great father, but a loyal husband and friend. Keane thanked him for welcoming him and his family from day one, and noted that the league has changed because of him. Keane couldn’t resist in closing out his speech saying that he hoped to see everyone back next year when they unveil his statue. Beckham was brought to tears as the statue was unveiled. As the man of the hour came to the mic, he thanked the city for their warm welcome when he and his family first arrived in LA. A man who was truly humbled by the honor that the LA Galaxy has bestowed upon him, going as far as thanking the kit man, Raul Vargas in referring the Galaxy organization as a family. He did not shy away from his rocky start with the team as he said that “it wasn’t always easy, I know, I know, and for that, I apologize.” He went on to say that he hoped he won fans over, acknowledging that his arrival was not going to be a successful until they found success on the field. Beckham closed out by saying that people used to tell him that LA was a place where dreams come true, and today, a dream came true.